Many people are dependent on Pharmacists for their medication. Unfortunately the constant working with drugs can lead to problems for pharmacists and such problems may lead to disciplinary or licensing issues. Bretton Barber is a Phoenix lawyer assisting professionals who are facing discipline hearings before the Arizona State Board of Pharmacy. If you find yourself facing allegations of misappropriating a controlled substance, or of other professional misconduct, then contact our attorney today to schedule an initial consultation. 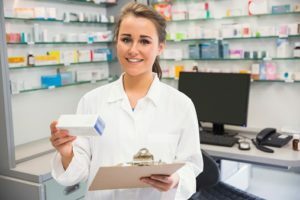 There are multiple situations in which a pharmacist may find themselves facing suspension of their professional license. These situations include one diverting medications due to addiction issues, helping others forge prescriptions, and selling drugs illegally. It can also include one’s criminal past haunting them during the application process. Regardless of the situation it is critical that one retain an attorney immediately to deal with the situation. This is true whether one has been charged with a misdemeanor or felony (which requires self-reporting within ten days under ARS 32-3208), whether one has been reported to the Arizona State Board of Pharmacy by a colleague, or whether one was reported by a third-party. Hiring counsel sooner, rather than later, can improves one’s chances of successfully navigating the process. Board of Pharmacy disciplinary proceedings will typically begin by the Board sending notice of the complaint and requesting an explanation from the licensed professional. If the Board is not satisfied with the response then it will proceed to a formal disciplinary hearing at which the Pharmacist may lose their license. If a license is revoked or if one feels that the board was unfair in their resolution of the matter, the process can move forward before an independent body. A hearing will be conducted by an Administrative Law Judge from the Arizona Office of Administrative Hearings. The hearing process will resemble a civil bench trial. At the conclusion of the hearing the Judge will issue a recommended ruling to the Pharmacy Board and the Board will issue a final decision regarding discipline. This final decision may be appealed to the Superior Court if the Pharmacist wishes. Bretton assists Phoenix area pharmacists and pharmacy technicians alleged to have diverted or otherwise misappropriated drugs or other controlled substances, as well as those who made innocent mistakes in dispensing medications which lead to discipline. Bretton will use your initial consultation to determine your side of the case and help you to understand your options. He will fully investigate the matter and at the hearing he will cross-examine any witnesses to ensure that your case is fully presented. He will be in regular contact with you throughout the process and will make himself available to answer any questions you may have. He understands the importance of your pharmacist license and he will give your case the attention it deserves. Contact us today to schedule an initial consultation with our lawyer. We also represent professionals in other Maricopa County cities such as Mesa, Glendale, Scottsdale, Chandler, and Gilbert. We also assist Pima County residents in Tucson. One of the greatest mistakes made by professionals such as pharmacists is that they do not take allegations of misconduct seriously from the beginning. If you are a pharmacist or pharmacist technician facing professional discipline then it is important to understand that the sooner you contact counsel then the sooner counsel can begin working on your defense. This may provide your attorney with an opportunity to resolve your matter in a way which preserves your license and spares you from having to attend the hearing process described above. Do not wait to seek legal representation. Do so today.